This is the annual gathering for physicians and scientists in biotech to exchange best practices in the advancement of drug development and business management. 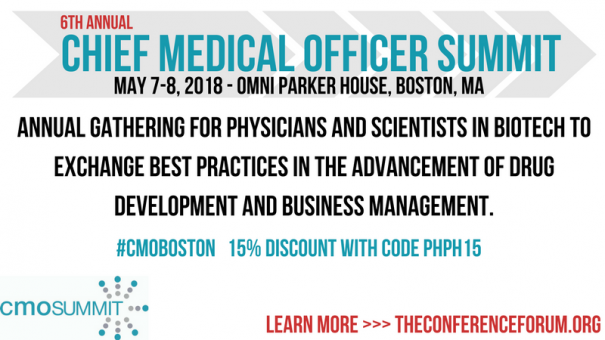 Although the program is primarily designed for CMOs of emerging biotech companies, CMOs of large pharma and other R&D decision-makers will also benefit. We are pleased to welcome Jim Roach, MD, CMO, Pulmatrix as co-chair of the CMO Summit for the first time. Also joining the Summit for the first time is Azmi Nabulsi, MD, CMSO, Head of R&D Strategic and Professional Affairs, Takeda Pharmaceuticals, who represents the CMO large pharma perspective. Ken Getz, Director of Sponsored Research Programs, Tufts CSDD, delivers his annual keynote on discussing Key Trends in the R&D Landscape.